1 nights stay in our luxurious two bedroom self-catering accommodation. Enjoy the privacy and freedom of a home away from home for the perfect mid-week or weekend break. Full access to our heated 20m Swimming Pool, Leisure Centre & Thermal Suite included. Our luxurious self-catering lodges are the perfect home away from home accommodation for families, golfers, corporate lettings and sports training camps. Each self-catering lodge consists of 1000 square foot over two floors, directly adjacent to the hotel. Overlooking the river Blackwater and set on 120 acres, The Lodges are located only 35 minutes from Dublin City and Dublin International Airport. 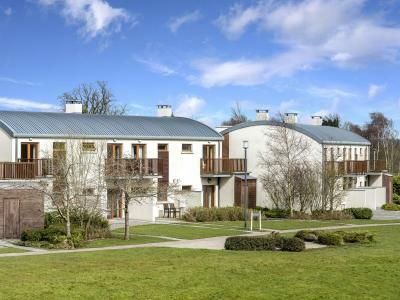 Whether your interested in exploring Dublin’s vibrant city centre or relaxing in the surrounding countryside, The Johnstown Estate Lodges offers the ideal accommodation. Each luxury self-catering lodge offers the comforts of a 4 Star Hotel, can accommodate up to four people, a terrace for those sunny evenings, private parking and full use of The Johnstown Estate hotel facilities. These include our exclusive leisure centre, spa and our wide range of dining options. Please note, check-in time is 4.00pm and check out time is 11.00am. There is no additional charge for electricity and no pets allowed.